There was much in the way of climate change and global warming news released this past week. While a lot of it, as is typical, was politically, emotionally and otherwise rhetorically slanted, there also was much of substance in terms of efforts to better understand what’s happening globally and locally in terms of climate change, as well efforts to do with climate change mitigation and adaptation. 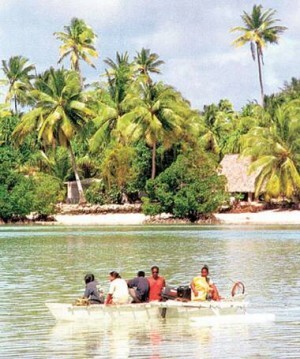 Perhaps most alarmingly portentous of the impact of climate change for human societies and civilization was news that the government of the South Pacific island of Kiribati are considering a range of relocation options, including relocating the entire population to man-made islands built along the lines of giant oil rigs, according to a report from the UK’s The Independent. Another option: relocating the populace to Fiji. Spanning some 33 coral atolls dotted across 2 million square miles of the Pacific, Kiribati’s highest point is a mere two meters above sea level. The island nation is losing land and crops to rising sea levels and seeing its freshwater sources contaminated by salt water. Attending the Pacific Islands Forum in Auckland, New Zealand last week, President Anote Tong last week told the Associated Press (AP) that his cabinet this week endorsed a plan to buy some 3,000 hectares on Vita Levu, Fiji’s main island with as a climate change insurance policy, should the nation’s 103,000 residents be forced to relocate. The government is also considering building massive sea walls, as well as super-sized, man-made derricks, but these would cost billions of dollars. Those dollars, largely, would have to come from international lending and aid agencies. Examining the issue of water supplies, food security and climate change from a global perspective, “an unprecedented rise in the demand for food, rapid urbanization and climate change are significantly threatening global water supplies,” according to the UN World Water Development Report, which is being released at the sixth UN World Water Forum in Marseille. Demand for food will increase 70% by 2050, prompting a 19% increase in demand for water by agriculture, which already consumes 70% of fresh water supplies, according to the report, entitled, “Managing Water Under Uncertainty and Risk. “The impact of climate change on water supplies will also increase, as a changing climate “will alter rainfall patterns and soil humidity, melt glaciers and cause water-related disasters such as floods and droughts, which impact food production.” These will affect as many as 44 million people around the world, the report authors estimate. Examining the issue of mass migrations caused by climate and environmental changes, the Asian Development Bank (ADB) is warning governments that they need to prepare for mass migrations due to rising sea levels, soil and fresh water degradation and seasonal droughts and flooding. Natural disasters, such as 2011’s floods in Thailand, forced 42 million people to relocate in the Asia-Pacific region in 2010, though exactly how much of this was caused by climate change remains uncertain. The Asia-Pacific is home to six of the ten countries considered most vulnerable to climate change. Fully 1/3 of Southeast Asia’s population lives in areas “at-risk,” including residents of Indonesia, Myanmar, the Philippines, Thailand and Vietnam, according to the report. an independent authority, to be known as the National Institute of Ecology and Climate Change, which will be directed by a government committee created by certain federal ministries.